The special day to give thanks to the almighty god. Celebration mode is on with family and friends around, happy get to gathers, lavish feast and lots more to enjoy. So, what are your plans for the day? Bring home friends and good wishes to make it the day of remembrance. Try these beautiful ideas to decorate your home to celebrate this most beautiful day. Wreaths are amazing entryway hangings that spreads instant festive cheer for special occasions. The felt leaf fall wreath, thanks giving door signs is just enough to create the classy display at your front doors. A complete warm welcome for the wonderful family holiday. Speaking walls to greet your loved ones for the season is an amazing idea. The removable thanks giving vinyl wall stickers will be the best choice to greet your family and friends in a warm style. Simply peel and dress up any space to create the seasonal wall appeal. 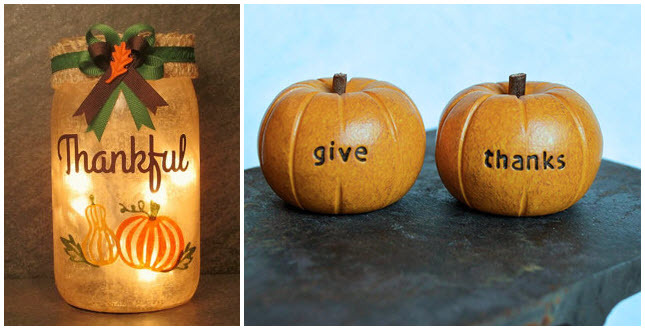 Load the side tables with cool and unique décor pieces like the thankful mason jar light, yellow orange give thanks handmade clay pumpkins to set some welcoming thanks giving tone indoors. Create the lush seasonal look on your table top with these cute decors. Personalized gifts will transform the ordinary feel to something extra ordinary. The thanks giving couple throw pillows, heart couple glass mugs can be personalized perfectly for a love filled picture perfect home décor for the season. Add elegant touch of fall to indoors with these customized punchy decors. Thanks giving balloon letter banner is the fun filled way to help kids understand to be thankful for their lives. The fall printable wall art with the striking set up will bring home the warm autumn touch for the special occasion. 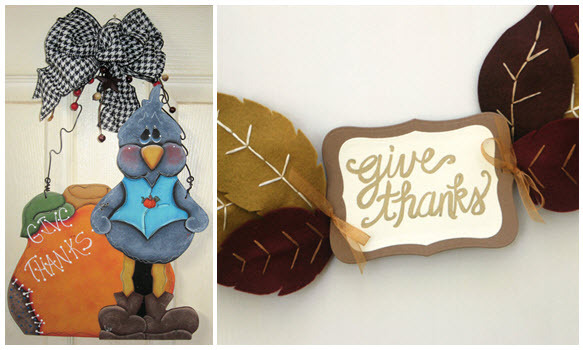 Create special thanks giving moments with these cute versions of décor. Unforgettable feast for the occasion is possible with the custom thanks giving table runner, vintage serving fork set filled with rustic love would look right at home on your thanks giving table. Fill your table with an extra festive display to spread the feasting mood. Express heartfelt thanks to your loved ones with these unique gifts. The folded book art, inspiration necklace will be an amazing decorative gift to take away the heart and love of your special ones. Impress every special individual in your life with these unique gifts that gives a chance to tell how important they are to you. Holiday is no doubt normally a “happy day” for everyone. This annual happy holiday is the right time for people to give thanks for what they have. Enjoy with your loved ones, exchange thanks and receive the blessings and mercies of almighty throughout the year. Unique pics related to the article is always welcome.